Today while driving I believe that I was blessed with fresh revelation. You can always discern when you have received a divine download because it is a burst of thought that you've never had, and frankly is not typical to the way you think. 1) Conditions were so horrible in their country that they would desire to escape poverty. 2) Wages US companies pay are better. 3) To do work that no one else would do. 4) They wanted to obtain the American dream. 5) They want access to our health care system that offers advanced treatment and technology. I hear those and think to some extent those are valid, but the revelation I got today was that those are just minor players in the whole scheme of things. 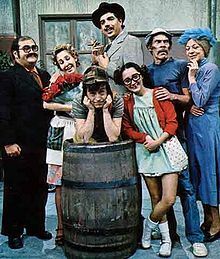 I believe now, with perfect clarity and understanding that Mexican illegals are risking bodily harm and rushing headlong to the US with abandon because Mexican television is just so horrible! What is up with that country and their thing for clowns and dirty old men? Why does every Mexican show have a half naked woman and some clown in it? I would attempt to run away from a scary clown and perverse immorality too! (I tried to cut the women out but the page wouldn't let me just show the clown image). Bringing this back to economics, what would Mexico do without it's oil resources? They are declining rapidly by the way, and all that will be left is a mass of humanity that desires to escape their awful tv to the land of the north.